The coming months will see the calorie content of menu items being listed in the Leinster House complex. FOOD SOLD IN Leinster House is to have its associated calories listed alongside it. The move comes after the Minister for Health, Dr James Reilly, presented research to the Oireachtas Joint Sub Committee on Administration which outlined the health benefits of calorie counts. A spokesperson from the Houses of the Oireachtas told TheJournal.ie that the initiative would be implemented over the coming months in the three catering outlets in the Leinster House complex – its self-service restaurant, members restaurant and coffee dock. Fine Gael TD, Jerry Buttimer, welcomed the move, saying that public representatives should “lead by example”. “I believe that people should be aware of how many calories they are consuming in a bid to get to grips with the obesity epidemic and live healthier lives,” he said. The self-service and members restaurant have, for the last number of years, displayed a “Healthy Option” notice on meals that are known to be healthier than others. 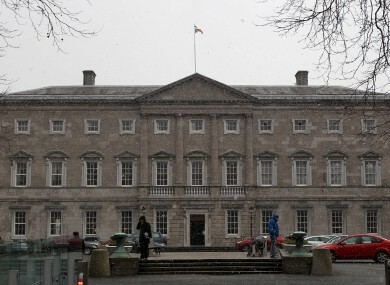 Email “Calorie counts coming to Leinster House”. Feedback on “Calorie counts coming to Leinster House”.